Laser Cutter for Laser Metal Cutting vs Abrasive Waterjet! So. . .What's Wrong with Using Laser A Laser Cutter? Laser Cutter . 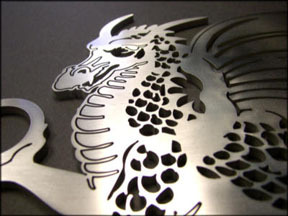 . . How does Laser Metal Cutting Technology Work vs Abrasive Waterjet Technology? Can you stack cut with a laser cutter? No, nope, nada! It will melt the layers together. Are you Ok with heat distortion, a Heat Affected Zone, or discoloration? Maybe. . .if the part I need to laser cut is not mission-critical! Or surface discoloration is not an issue. You must, however, take into consideration the important effect that the heat a laser metal cutting beam has on metals. Stressed, tempered, annealed, or made harder at the cut surface. This can create problems for secondary processes. Are you cutting reflective material? Laser cutters work best when cutting dark, solid, or opaque materials. Remember the light? It is better to not have it diffused. I didn’t say it wouldn’t cut! The finish of the cut edge will just suffer some. How thick is the material you intend on laser cutting? You say 1/2”? Ouch! It’s a little harder finding cnc laser cutters to handle this job. I didn’t say you can’t. I am simply saying that most laser cutters do a better job on thinner materials. Generally speaking, the thicker, the more power the machine needs for metal laser cutting. Some of the bigger, industrial laser cutting tools deliver 50kW of power. It takes a small fortune just to turn these honeys on. What is the minimum order? In dollars? In pieces? Many laser metal cutting shops won’t even sneeze at you for less than $200.00. They can’t even think about it. The less expensive machines are close to $1,000.000.00! That’s not pocket change. Sooo. . .how does a laser cutter work? I could give you all the possibilities, and all the different types and sizes of machines, but at the risk of having those triple thick glassed, pocket protector, slide ruler “type” pick me apart, I will attempt to explain it somewhat simply. Repeat after me. . .laser is an acronym. . . Never mind! A laser is nothing more than a concentrated beam of light (photons) focused on a single point, you know, kind of like the magnifying glass you used on a sunny day to burn some leaves, or a piece of wood when you were a kid. Only this beam of light is much, much more powerful. Simply . . . Here goes. . . Typically, there exists an optical cavity with a gas, such as CO2, or other gain medium with optical properties. This cavity characteristically uses a series of bend mirrors that control, or determine the wavelength of the beam. These mirrors also ensure that most of the light makes many passes through this gas, or gain medium to amplify the power. Eventually, the amplified light or power passes through a partially transparent mirror and appears as a beam of light. Now, we have this intense beam of focused energy or light particles. What are we going to do with it? We are going to transfer this energy into a material. It will vaporize, boil off, or melt this material, depending on the properties of the material being energized. Fancy way to say we cut it. So much for my simplified version. If you are looking to cut a thinner gauge of steel and discoloration or heat is not an issue for you, laser cutting tools with this technology may be right for you. Also, cnc laser cutters are very effective for cutting even thicker pieces of softer materials, check out this link for examples of a laser cutter used with acrylics. It is also very effective for engraving work. The first working laser cutter was demonstrated in May 1960 by Theodore Maiman at Hughes Research Laboratories. What would we do without them now?